Global demand for oil has stayed roughly steady at 2 litres/capita/day for the past few decades according to a paper by Joyce M. Dargy and Dermot Gately (via EconBrowser). But this apparent stability masks a violent underlying reality. 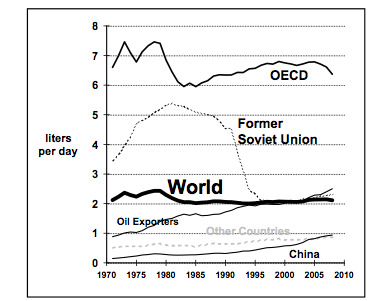 Since 1971, OECD countries have made major efficiency strides, the Soviet Union saw an economic collapse, and the non-OECD developing world has seen soaring demand. And as Dargy and Gately put it, the “low-hanging fruit” is over. There are no more developed-world magic bullets. the Former Soviet Union (FSU) isn’t collapsing again, and the developing world, notably China, isn’t in place to start making big efficiency gains. As such, expect the global oil “problem” to get more severe. Beyond that — and this is really the crux of Dargy and Gately’s paper — the new global energy mix is much less sensitive to price spikes than the old mix. In otherwords, whereas price spikes in the 70s caused major pullbacks in consumption (keeping things in equilibrium), similar price spikes these days don’t result in the same. This doesn’t tell you anything about short or medium-term (probably) prices, but the suggestion is that if the global economy continues to grow at a steady pace, oil prices will get A LOT higher.